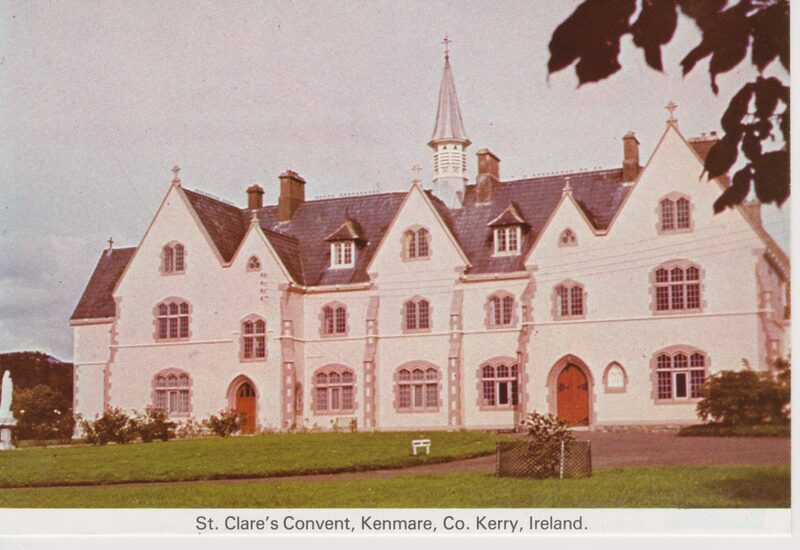 The story of the Convent of Poor Clare’s in Kenmare began in Newry in 1861, 157 years ago, when Most Rev Dr Moriarty, Bishop of Kerry though he would like to have a convent in Kenmare. This idea had long been a dream of his Vicar General, Rev Dr John O’Sullivan, Parish priest of Kenmare, who then acted promptly on learning of the Bishop’s thinking. He contacted the then Abbess of Newry, Mother Mary O’Hagan and proposed a foundation in Kenmare. 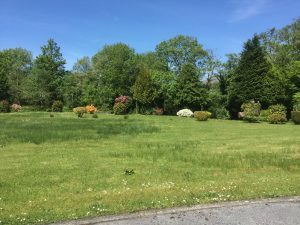 On October 21st, 1861, Mother Mary O’Hagan herself and five other sisters, Sr Bonaventure McLaughlinn, Sr Aloysius Collins, Sr Teresa Lowry, Sr Michael Denvir, Sr Francis Clare Cusack and Sr Catherine Dugdale, set out for Kenmare. Their first dwelling was “Rose Cottage”, where they lived while the convent and schools were being built. Their first school was an old building which had been in use as an auxiliary workhouse during the famine. An old coach house behind Rose Cottage became a breakfast hall where a warm breakfast was provided for many of the children who came. This was important as there was much poverty and need among the local population. 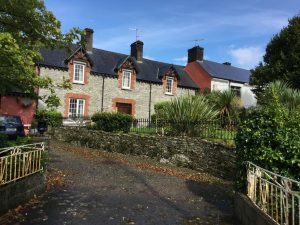 Life in Kenmare began with the celebration of the Eucharist in Rose Cottage and the sisters took up their work from there. The new schools opened in May 1862 and the sisters moved into the new convent on July 12th 1862. Destitution and unemployment were widespread so a Lace School also was started. Girls and young women learned to make needlepoint and other high class laces and as they became more skilled, this earned them an income. Before long Kenmare Lace became famous and won awards at many exhibitions, even as far away as London, St Louis, RDS Dublin and Lancaster. Among other skills taught were woodcarving, leatherwork, crochet and embroidery. The Presentation Sisters had been in Kenmare and had begun the work which was taken up by our sisters. There was a number of National Schools in the parish and lacemaking, crochet and embroidery were taught in the town school. By 1870 there were more than 500 on Roll. Attendance was low at times, due to help needed at home, winter weather and to some children spending time in service. The school prospered and received excellent reports from Inspectors. A number of the sisters were examined by the Inspectors and qualified to receive salaries. These they did not wish to accept as they looked on their work as charity work. At one stage there were 17 sisters teaching in the school and instrumental music and other extras were taught. The moral and educational standard was high. Many young women went on to become teachers in other schools, bringing with them the standards of goodness, moral values and education learned in Kenmare. However, he pupils were encouraged to improve their English, so the local/native Irish language suffered as a result. The good work of education continued to expand and flourish. By 1961-’62 there was a ful Secondary School for girls. Around 1998 there came a new development at second level – a new Community School – Pobalscoil Inbhear Scéine – catering for all the young people of the area from 12yrs on, both boys and girls. Although no sisters teach there now, Pobalscoil Inbhear Scéine continues the good work started there 157 years ago. 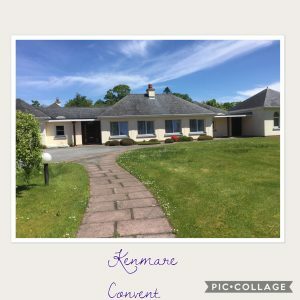 Due to the age profile of the present community of St Clare’s Convent, Kenmare, their mission has evolved and become a Prayer ministry.